Colourful One Love�Batik�design with a lion in the centre�by The Mountain.�Sizes up to 5XL. Colourful Batik Campervan design�by The Mountain.�Sizes up to 5XL. 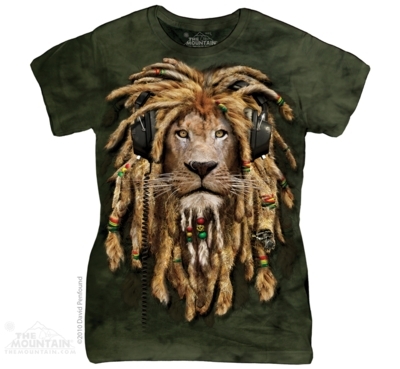 This t-shirt has a great image of�DJ Jahman, the�Rasta lion, with his mane plaited into dreadlocks. Made in the�USA from preshrunk 100% heavyweight cotton.�Sizes up to 5XL. This kitten is the coolest kitten in town and would love to chill out with you and listen to some music. A stunning cat picture printed across the chest on a, top quality cotton T Shirt. Made in the USA from preshrunk 100% heavyweight cotton. ONLY SMALL LEFT! Show off your alien printed across the chest on a top quality cotton T Shirt. This science fiction print with an alien in a jammin Jamaican rastafari outfit, enjoying a smoke, will get people talking. ONLY XL LEFT! 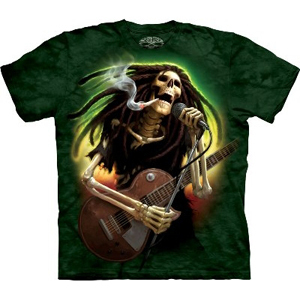 A skeleton with long dread locks, is rocking out with his guitar and a joint in his mouth. A great dark fantasy t-shirt from Skulbone. 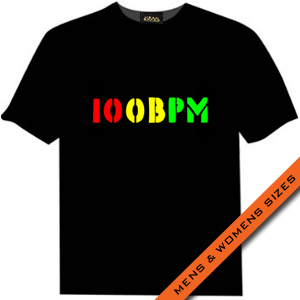 Chillin' the Reggae way .... 100BPM. Soft Feel High Quality 100% Cotton T-Shirt. Sizes up to 5XL. Awesome All Over (front, back, sleeves, all over! )�Tie Dye T-Shirt from Head Space. Photo for reference purposes only, as due to the manufacturing process, each one is different! With white stitching detail.�Sizes up to 2XL. Awesome All Over (front, back, sleeves, all over! )�Tie Dye T-Shirt from Head Space. Photo for reference purposes only, as due to the manufacturing process, each one is different! With white stitching detail. This version of the t-shirt glows up under UV lighting!�Sizes up to 2XL. 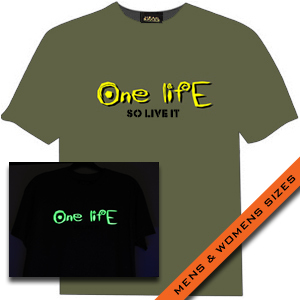 Awesome One Life So Live�It T-Shirt from Head Space. Classic Olive�t-shirt with a fluro yellow and black design.�Sizes up to 2XL. Layan Logo Lion T-Shirt from Layan Gear. 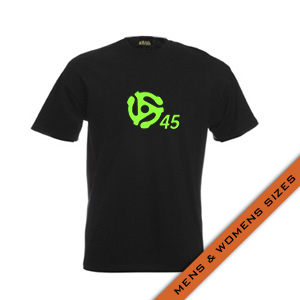 Classic Olive�t-shirt with a black, red,�fluro yellow and fluro green (both glow under UV lights! )�design.�Sizes up to 2XL. 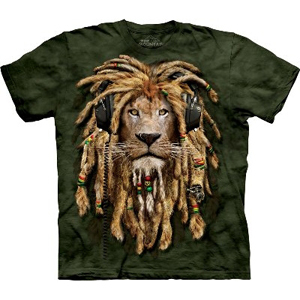 This t-shirt has a great image of Smokin' DJ Jahman, the�Rasta lion, with his mane plaited into dreadlocks. Made in the�USA from preshrunk 100% heavyweight cotton.�Sizes up to 5XL. 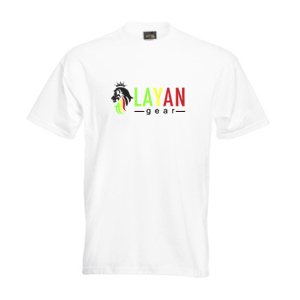 Layan Gear T-Shirt from Layan Gear. Grey�t-shirt with a black, red,�fluro yellow and fluro green (both glow under UV lights! )�design.�Sizes up to 2XL. Layan Gear T-Shirt from Layan Gear. White�t-shirt with a black, red,�fluro yellow and fluro green (both glow under UV lights! )�design.�Sizes up to 2XL. 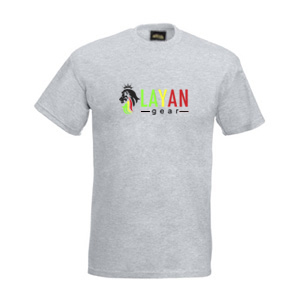 Layan Promotions T-Shirt from Layan Gear. White t-shirt with a black, red, fluro yellow and fluro green (both glow under UV lights!) design. Sizes up to 2XL. 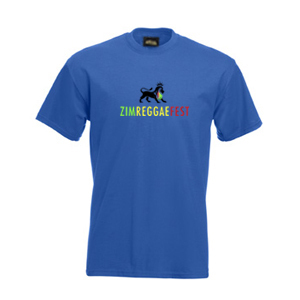 ZIMREGGAEFEST T-Shirt from Layan Gear. Royal Blue t-shirt with a black, red, fluro yellow and fluro green (both glow under UV lights!) design. Sizes up to 2XL. Layan Gear Conquering Lion Logo T-Shirt. Grey t-shirt with a black, red, fluro yellow and fluro green (both glow under UV lights!) design. Sizes up to 2XL. 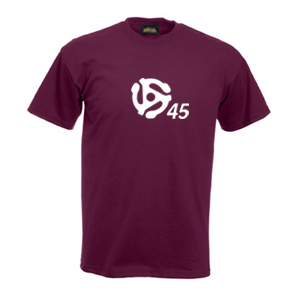 Awesome 45 Vinyl design from Head Space�featuring a 45rpm centre insert adaptor for dinked records in white on a burgundy t-shirt.�Plus a white�HEAD SPACE on the shoulder.�Sizes up to 2XL. 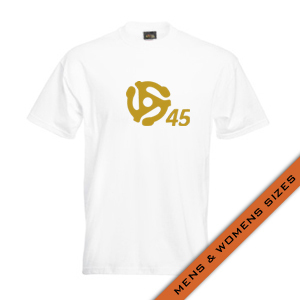 Awesome 45 Vinyl design from Head Space�featuring a 45rpm centre insert adaptor for dinked records in Limited Edition Gold�on a White�t-shirt.�Plus a Gold�HEAD SPACE on the shoulder.�Sizes up to 5XL. Awesome 45 Vinyl design from Head Space�featuring a 45rpm centre insert adaptor for dinked records in fluro green.�Plus a�fluro green HEAD SPACE on the shoulder. Both glow under UV! Sizes up to 5XL. 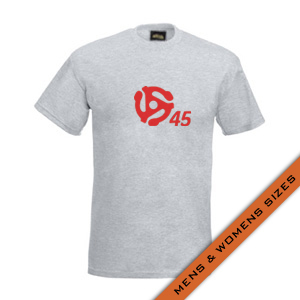 Awesome 45 Vinyl design from Head Space�featuring a 45rpm centre insert adaptor for dinked records in Red�on a Grey�t-shirt.�Plus a Red�HEAD SPACE on the shoulder.�Sizes up to 5XL. 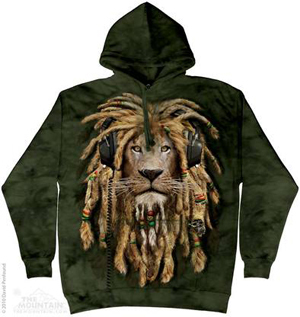 Big Cat hoodie with a Rasta lion trying his paws at being a music DJ. Design by The Mountain. 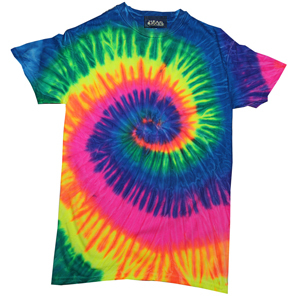 A great�design from a range of colourful tie-dyed t-shirts. This�is a turtle t-shirt�with a peace sign within a heart as its body. 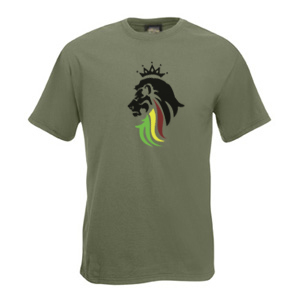 This t-shirt has a great image of�DJ Jahman, the�Rasta lion, with his mane plaited into dreadlocks. Made in the�USA from preshrunk 100% heavyweight cotton. 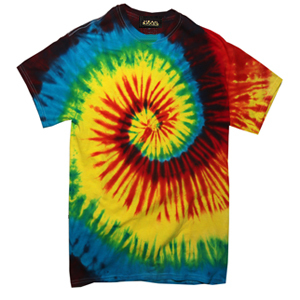 A great�design from a range of colourful tie-dyed t-shirts. This�is a turtle t-shirt�with a peace sign within a heart as its body.�Sizes up to 5XL. 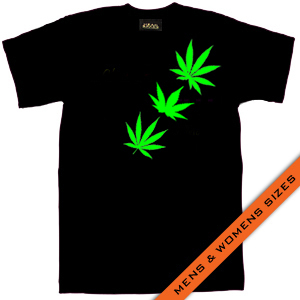 Cannabis Leaf design from Head Space.�Black t-shirt with a�fluro green�logo on the front and fluro green�HEAD SPACE on the shoulder. Both glow under UV!�Sizes up to 5XL. 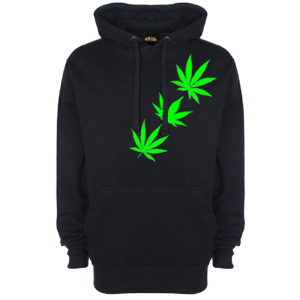 Cannabis Leaf design from Head Space.�Black pullover hoodie�with a�fluro green�logo on the front and fluro green�HEAD SPACE on the shoulder. Both glow under UV! Cannabis Leaf design from Head Space. 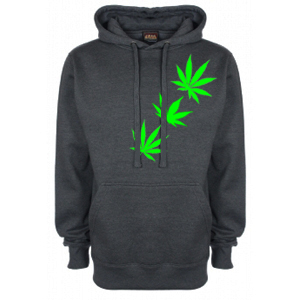 Charcoal�pullover hoodie�with a�fluro green�logo on the front and fluro green�HEAD SPACE on the shoulder. Both glow under UV! 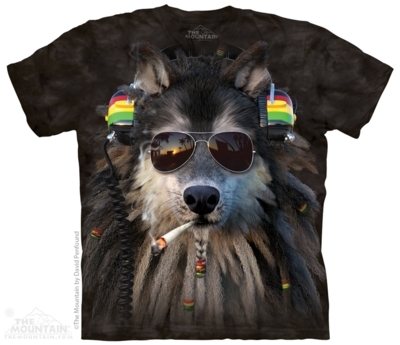 Animal t-shirt�showing a wolf with dreadlocks, wearing sunglasses, rasta coloured headphones�and hairbands,�having a smoke.�Design by The Mountain.�Sizes up to 5XL. 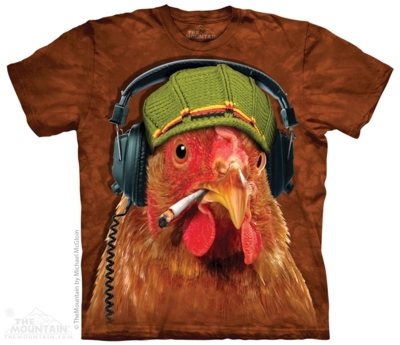 Humorous bird t-shirt with a hen wearing a hat,�smoking and listening to music. You don't see that everyday.�Design by The Mountain.�Sizes up to 5XL. 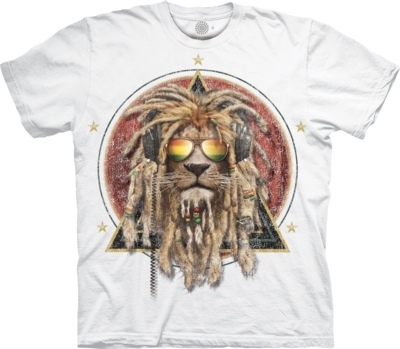 Ladies t-shirt with a Rasta lion trying his paws at being a music DJ. Design by The Mountain. 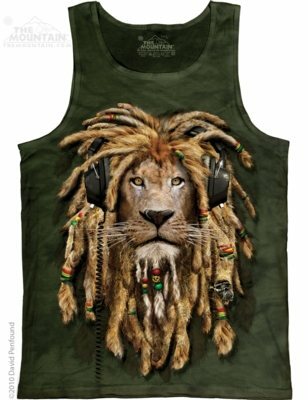 This tank top for both men and women is not only comfortable, it also has a great image of DJ Jahman, the rasta, music loving lion.�Design by The Mountain. The Mountain brings you this Special Edition White t-shirt, printed with the popular DJ Lion Retro design by artist David Penfound.